Because of the ambassador’s function as a go-between between two divergent or even opposite interests, this functionary has often appeared in cult-television programming as a person of duplicitous or suspicious motives. Much like the defector character trope, which I featured a few weeks back, the ambassador is someone who can appear to be one thing, but may actually be something else. With ambassadors, hidden agendas abound. In TV series of political intrigue and competition -- such as the original Bruce Geller Cold War era program, Mission: Impossible (1966 – 1973) -- the ambassador may be an important figure who requires rescuing. This is the premise of the first season installment, “Shock,” which features James Daly as a captured ambassador secretly replaced by an enemy imposter of an Eastern Bloc nation. 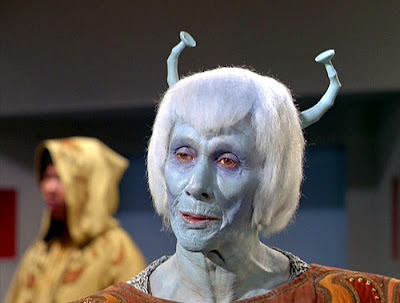 Revealing the political nature, perhaps, of space adventuring, ambassadors have often been featured in prominent roles in episodes of virtually every Star Trek incarnation. In virtually all these scenarios, the ambassador is seen as a difficult sort; one whose need for successful diplomacy tends to endanger missions, crew members or otherwise lead to danger. 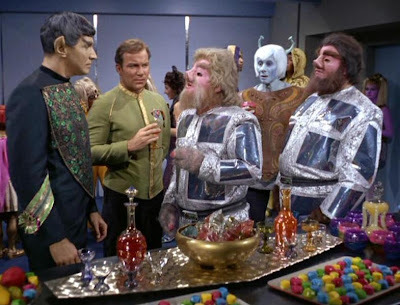 Often in science fiction television, it is the job, explicitly, of the Ambassador to act as peacekeeper, to prevent a war during a cosmic or interstellar incident. Sometimes these ambassadors are malevolent themselves, as was the case in Buck Rogers in the 25th Century’s “Planet of the Amazon Women.” Mark Lenard, meanwhile played a different kind of alien ambassador, Duvoe, in the Buck Rogers second season episode, “Journey to Oasis.” His species could, oddly, separate into two parts: head and trunk. It’s a skill that his people have successfully kept hidden. But as war looms with Earth, Duvoe and his people must finally reveal more of their true nature. JMS’s Babylon 5 (1994 – 1999) featured a number of colorful ambassadors among its regular cast of characters. 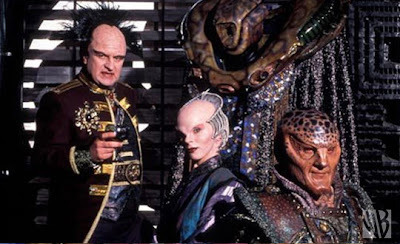 These included the Minbari Ambassador, Delenn (Mira Furlan), Londo Mollari (Peter Jurasik) of the Centauri Republic, G’Kar of the Narn (Andreas Katsulas) and the fearsome-looking Vorlon Ambassador. As you might suspect, the sheer number of ambassadors stationed on the space station Babylon 5 resulted in frequent intrigue, espionage, and bickering.